As a leading destination for pop-culture enthusiasts, Paste highlights the best of what’s next in Music, Movies, TV, Games, Comedy, Books, Comics, Drink and Politics. Since 2002, the site has grown to more than 8.4 million unique visitors each month. 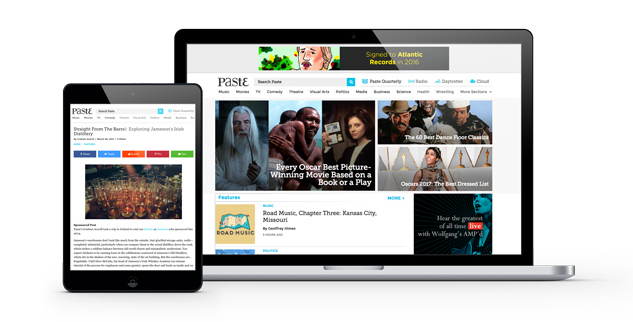 The Paste editorial team crafts original, engaging content every day and we enlist the same creative approach to help brands connect with our enthusiastic readers. Balancing a whimsical sense of fun with an appetite for smart substance, Paste's Atlanta-based editorial team posts over 50 features, interviews, lists, galleries and news items each day. Our NYC-based music office broadcasts daily Facebook Live and YouTube Live sessions featuring top artists like Matisyahu and Ani DiFranco, along with emerging talent like Grace VanderWaal and ALA.NI. And our huge collection of over 130,000 live audio/video performances keep our million of fans coming back for more every day. Our editorial voices and tastemakers drive influence across 22 unique channels. We socialize our content 24/7 bringing compelling viewpoints to the most valuable audiences. Along with its sister companies, Daytrotter and Wolfgang's, Paste reaches over 50 million consumers each year through our events, social media, daily newsletters and websites.